Excitement! The new Autumn/Winter Mini is here! I’m so excited to be able to introduce Stampin’Up’s! 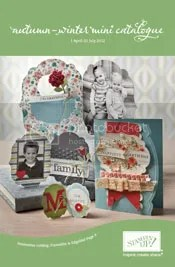 new autumn/winter mini catalogue. Without a doubt this is the bestest mini we have ever had. Big statement do you think? Well call me for your free copy and I know you are going to agree with me. This mini has it all. Simply Scored tool (far outweighs, outstrips, outperforms it’s opposition), Framlits (to die for – pardon the pun! ), Edgelits, Embossing Folders and the most sensationalist stamp sets – one with a matching punch! Stampin’Up! you’ve done it again. Just click on the image to view the catalogue for yourself and if you want me to send you a hard copy, just drop me a line. Love to do that for you. Want some of it? Place an order now. Want lots of it? Book your demonstration today. Want all of it???? Talk to me about joining my team, The Bent Ink-linations and enjoy a healthy discount on all your purchases.